The x coordinate of the light position. The y coordinate of the light position. The z coordinate of the light position. 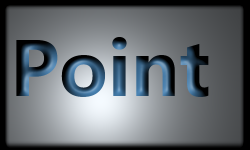 Creates a new instance of Point light with default parameters. Creates a new instance of Point light with the specified x, y, x, and color. Gets the value of the property x. Gets the value of the property y. Gets the value of the property z. Sets the value of the property x. Sets the value of the property y. Sets the value of the property z.